Rules for the draw and errata below. You can't have the same card as the opponent. With about equal chance. You will have the mana to play the mana generator on your first turn, unless the opponent does something to reduce your mana. The chance of drawing each card is about a third, and the chance of opponent having a card if you don't, is roughly half. Exception: Chance to draw Phoenix is only about 14%, and chance of opponent having it if you don't about 17%. -If a spell is played that kill both players, the player who played the spell wins. -In the same way, the leftmost effect takes place first. So if you have a Sea Sprite that brings you below 1 life, you will die, even if there is another creature to the right that would've brought you back above. -Dragon will not boost illusion 3. -Dragon will not boost the damage output of Blood Ritual or Explosion if the dragon itself is the creature being sacrificed to play these spells. -Golems can still be stunned by Sonic Boom and Scorpion, even though they are immune to damage done by spells or creature abilities. -Golems can be damaged by Hydra etc. Since it is an attack. -Phoenix doesn't die from an opponents damage spell, that also reduced fire power below 10. -When Dragon and an Air 1 are both boosting a spell, the Air 1 effect takes place after the the dragon effect. -Tornado. If targetet on a respawning demon, it will respawn. -If you play Earth 6 while an Earth Elemental is one of your two strongest creatures, the spell will deal damage based on the Earth Elemental's attack right before the spell was cast. The Earth Elemental's attack will be lowered to reflect the drain of Earth mana after this damage has already been done. -Wall of reflection doesn't deal damage if its the target of Tornado, Sorcery 8, or if Death 7 is played. -Keeper of death: Spells affect the opponent first. So if you kill all creatures on the board, you gain points equal to all your opponents creatures. If the opponent kills all creatures, you get nothing. -Basilisk kills illusion 2 and Golems, if they have <=6 health. -If a 1 hp White Elephant is hit with an Armageddon (or any direct damage spell), it will absorb the entire spell's worth of damage and none of it will bleed through to the player. -Mindstealer vs Lightning Cloud: Lightning Cloud deals 4 to itself only. This holds only if they're directly opposite. -Mindstealer vs Ice Golem. Golem takes 4 damage from itself. -A Phoenix that is killed by Sonic Boom and which then rises again will not be stunned and thus will be able to attack normally. Demon 1, Demon 5, and Demon 7 also arise unstunned if they're killed by a sonic boom. However, if a demon 5 is stunned by sonic boom, killing it by demon 2, will make the newspawned demon 5 be stunned. -Insanian shaman will only hit an element with 0 mana, if there are none higher. It will only hit an element with 1 mana if there are none higher. - If you have Chrono Engine, and opponent casts Ancient Giant or Time Stop, you get 1 turn. - If you have 2 Chrono Engines, you get +2 Time mana per skipped turn. Also check out the post Jul-14-2009 04:59 in New player guide. Definitely, but I don't know how to link directly to it, or if that is even possible. The sweep/mana guy is 50% for the player who goes first. It's chain lightning which is 50% for the first player. Then it's 50% between the other two cards for the player who goes second. True, it's Chain Lightning, corrected. It's not 50-50 between the remaining two, for the second player. While it is obvious, you should also include that no two players can have the same card. You should also clarify that the 1% rule only applies to the elements. Then I think you've covered everything there is to cover. 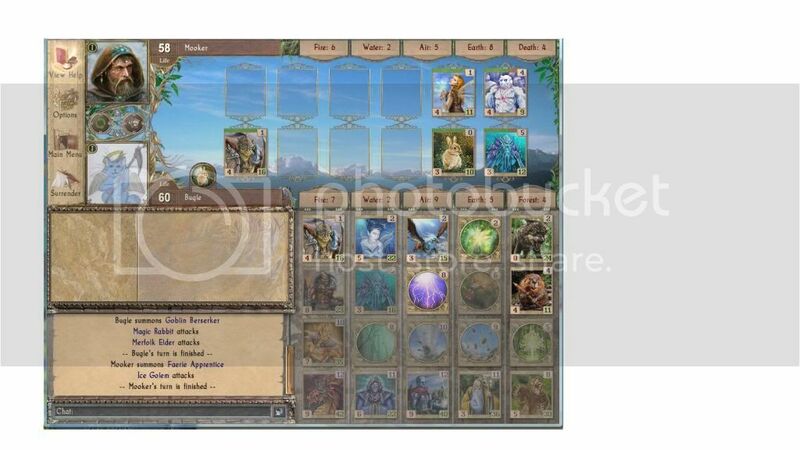 Your pack of cards is composed of 16 elemental cards and 4 special. They are stowed into the table with five columns and four rows. 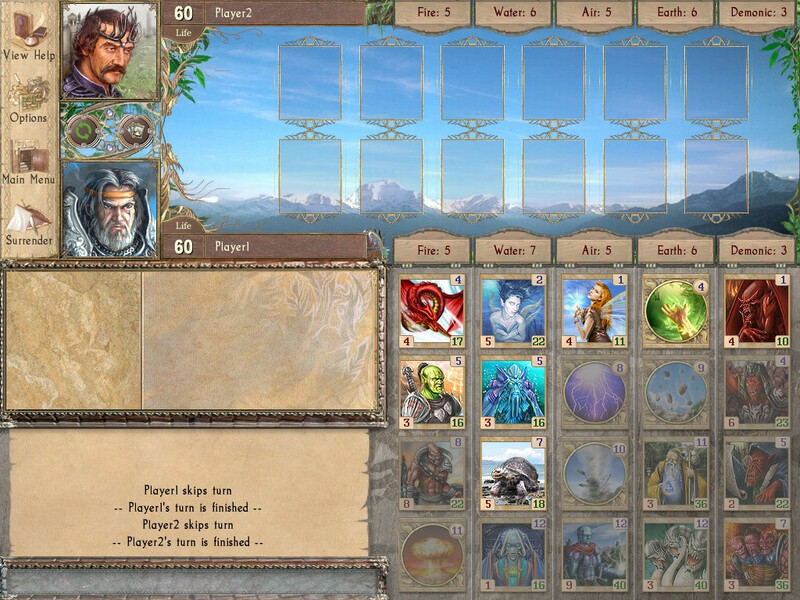 Some elemental cards can be situated in a variety of rows. Here you see my version of card distribution in the 1.1 version. Pay attention that Inferno&Stone Rain nowadays can't be in the fourth row and fire&earth4 can be situated in the 1st. In the previous version I remember I had had some games with 11-cost creatures&spell in the 3rd row, but in the 1.1 version i haven't met this yet. Do you agree with this distribution? To predict opponent's cards you should summarize this with your cards, banned combos, 1% Wiggin's rule and with "the lower-cost card can't be situated higher than more mana-expensive in the column." I don't think the 1% rule applies in 1.1.. I've seen a number of draws already with stone rain and earth elemental, and others. In 1.03 it was 1-3,4-8,9-12, one arbitrary. Now I 'm not sure, although I have seen earth 4 as the lowest earth. We really need Silbe again for 1.1. Or the developers could tell us. Btw, thanks for pinning the thread. any draw can potentially begin at 4 now. i've never seen ice golem, but i have seen fire drake, faerie sage, and rejuvenation. i assume ice golem can happen too but it'd probably be very rare. any draw can still end at 9. i don't know how clever got it in his head that it couldn't. i've gotten the 9 card in all four elements in my bottom slot at least once this patch. So if you see a Scorpion, you don't have to worry about whether it's going to get healed by a Magic Hamster. Nature Ritual + Wall of Reflection ? Regarding mediation bans, it is because it would be too easy to just sit back and save up mana with mediation, while killing all creatures your opponent plays with the cheap mass destruction. Nature Ritual + Wall of Reflection I'm not sure about. It deals 8 damage and heals 8 life for 2 earth mana. Which can be strong, but I don't think a ban was necessary. If you meditate while you 're recharging E9 I can add on the field 1 f1 x 4 turn = 40 damage so it's sort of complicated I suppose. It deals 8 extra damage, heals you 8 life, AND protects you from 8 more damage, all for your turn and 2 Earth mana. That's a net gain of 16 life plus 8 direct damage to the enemy; although both are in "slow motion", I feel this was a smart ban. Is wall of reflection banned with other healing cards? Like from the specialty classes? Sorcery 1 also means you deal 8 extra damage, protects you from 8 more damage. It's half the cost AND heals two other creatures (which could be more walls of reflection). Ah yes, you're right. It probably makes sense. Nature Ritual + Wall of Reflection - is it so destructive? Ice Golem + Cursed Fog - is it so destructive? Do they dislike Cursed Fog,or entire Death? If Greater Demon+Armageddon is banned,It's nonsense to limit Grater Demon's special damage less or equal 10 when come on stage. I'm not sure what the sea sprite + fog combo is. But the ban with meditation is because cursed fog costs only 2. This means you can spam cursed fog at the beginning of the game, and use meditation to build up your elemental powers. Compare with acid rain, which deals 15 damage but costs 8. Ice Golem - it's immune to cursed rain. It's one of the only two cards immune to spell damage. If you use ice golems, then youc an spam cursed fog every two turns against the opponent and not have your own creatures damaged. Since you have ice golem, obviously the opponent doesn't have it. I think because nature ritual is one of the few waysy ou can heal monsters using elemental decks, and it's cheap. I hope Greater Demon's damage limit to 12.If the combination is banned,it's appropriate. You should treat special power three-seconds as basic one. Basically,Cursed Fog spam is suicidal way.Most creature have over 12 lives,besides Meditation and Fog don't place creature.You lose creatures,life,and most precious power,besides enemy have creature in slot,you have no one after spamming. If there is Ice Golem & Fog combination then under 17 life creature can't damage golem within spamming,but spamming at most 2 or 3 turns,and no creature place.Does 1 or 2 Golem make big damage within 2-3 turns? I suggest Cursed fog cost to 3 and Banshee cost to 2,and lift of the ban,halve fog damage to death creatures. Note:Cost 3 fog deprive death powers to place creatures. You're missing the point entirely. Cursed fog spam means most low-end creates won't survive two of them. Your opponent is playing creatures, so they are essentially lossing mana. Where as you are not wasting any elemental mana. If you could meditate. Then you can use cursed fog to keep the field clear, your opponent will waste mana playing monsters that will only get killed (they wont' have meditation since you have it. Most other spells wno't be terribly efficient/useful at this point). And after a few rounds of it, you would have high elemental mana because you haven't used it and have been meditating. It is destruction. Which is why it's a banned combo. btw, you don't lose any creatures because you aren't placing any. You may be a bit lower on health but the idea is that you will be a lot higher on elemental mana. I think golum + cursed fog isn't nessasarily for the start of the game. You can get a few golems on the board, then spam cursed fog. It kills opponent creatues, easily giving you board control. I do think that was the point. The other point is, if you have golem your opponent does not. I assume the ban was partly put in place because if you have the golem + cursed fog advantage, then it also means your opponent does not have the golem to help counter cursed fog. The two together means golem + cursed fog was deemed rather umba. Despite death showed fog,opponent don't take appropriate way that mean he is amateur. Well,there is deep problem about banning. Illusionist have 50% chance to get Natural Ritual compared to others . Necromancer have 50% chance to get Armageddon,Meditation,Ice Golem compared to ohers. If both class have card which cause ban,then they are limited possibility come from cards not only banned combination. Death have half chance of using Ice Golem&Stone Rain combi,Illusion can't heal other creature with Natural Ritual when he has wall. Besides,opponent predict what cards Illusion/Death have more easily. I go against any kind of ban without really destructive. I think it is Reflection Wall+Armageddon only. I have checked almost a hundred time with hotseat. Phoenix adjacent combination occurred only one time.It's probably 1% exception. F6/F7 occurred at short intervals.It's anomaly. Any other F1-8 adjacent combinations somewhat rare. I have hypothesis that 1st,2nd,3rd deal is under adjacent ban rule,and 4th arbitrary deal card disregards adjacent ban. I don't get what you are saying. Pulling combination from the draw is exactly how the ban is enforced - by making sure that combination of cards is never drawn. no, the banning is when the cards are drawn, certain combos are cards are never drawn. However when you play against the AI, sometimes card draws are broken. For example, there are some matches in the tournament that randomize your cards - that means you can get banned combos. Some matches that specify you don't get certain cards or get certain cards. If you play through the storyline, this is even more profound because there are many 'special' matches. Can someone explain me why cursed fog + med is banned? I assume it's so you can't gain mana by giving up board control via Meditation, then just blow the place sky high with repeated Cursed Fog-s. Having said that, since Cursed Fog can only deal 12 damage a turn, I don't see any reasonable scenario where someone would actually want to do this. hmm... It doesn't seem like a very smart way to play. 1. What are you going to do every other turn? You can't play any monsters, cause they'll just get chewed up by your own cursed fog. You should stick to playing spell cards. And what's the best spammable spell card while you 'wait'? Meditation. 2. What can the opponent do when you are spamming -12hp to every monster on the board every two turns? They shouldn't play any weak monsters. So until later in the game and they have more mana to go in for the kill, they have to play spell cards. Meditation would be most helpful. Creatures that are feasible in the first four turns and net you some kind of advantage if your opponent is repeatedly playing Cursed Fog include Goblin Berserker, Goblin Shaman, Ice Golem, Steel Golem, Griffin, Insanian Peacekeeper, Insanian Berserker, Wolverine, Lemure, Ergodemon, Keeper of Death, Priest of Fire, Giant Turtle (especially if you also have Nature Ritual), Wall of Lightnings (especially if you also have NR), and Wall of Reflections. There are a lot of spells that are defensible moves against it, too (especially Meditation, Overtime, and Sacrifice, but also certain damage spells). Well the question was why meditation, of all cards, was banned in a combo with D2. Even if the combo isn't very good, as you've been pointing out, meditation stands out as being the only actual spammable spell from the elemental classes. E2 is useless without a creature, and next is A3... which at 3 mana isn't really that spammable. Right, and while you've got an interesting explanation, I personally think it has more to do with the mana-for-turns tradeoff that Meditation enables than with the spammability of it. This is largely the same reason Meditation is banned with Stone Rain (which I think is actually perfectly reasonable). In theory you could play Meditation a few times to start the game, then use Cursed Fog 3 or 4 times to wipe out the opponent's board advantage. But in practice, a good opponent will easily be able to parlay their turns into an advantage against this strategy. That's why I don't think the ban is necessary. If you're right and it has to do with the spammability, how could that ever be used in a broken way? Would the strategy be to keep alternating between Meditation and Cursed Fog? The way I see it, that could be defeated easily using any Cost 1-2 creatures, any Golem, Priest of Fire, or Elf Hermit. Hmm... my point about spammability was less about Cursed Fog + Meditation being powerful or useful together. But that if one player was spamming Cursed Fog, then meditation gives the *other* player a spammable spell. I assume banning the combo means if one player has Cursed Fog, the chances of the other player getting Meditation should be higher. However you're right in that compared to the other combos, this one doesn't seem obvious. I say it's possibly because Meditation is spammable, but admittedly it's not that strong an explanation either. Ah, that's an interesting point. You could very well be right about that. I suspect that they were right, and meditation plus fog is very strong. Difficult to know without trying it out though. will basilisk kill phoenix agaisnt him? No (unless Fire < 10). "basilisk destroys creatures with 6 life or less"
It does destroy Ice Golem (when its HP is 6 or less) and Phantom Warrior, though. "Destroy" is the correct wording for Basilisk. It's just that Phoenix is affected by other cards very inconsistently. Tornado destroys it, but Death 7 doesn't. Sacrifice and Blood Ritual destroy it, but Basilisk doesn't. It's the behavior of Phoenix that probably needs to be changed. Either make it immune to being destroyed entirely, except when it is sacrificed (by Death 4, Death 5, or Sorcery 4), or make it immune only to dying by damage. Don't be afraid of adding '-more-' to end of description,and writing complicated exceptions in another page. It's computer game not paper card. A solid idea. I'd also suggest possibly putting information like this in an expanded version of the in-game "Help" instead. "Kill" would work better than anything that we have now, although it adds another named concept to a game (which really shouldn't be necessary) that is played by many international players who don't know English very well (but play the English version), which is why it's a little dicey. You can't click -more- since your mouse is over a card. Demon Apostate is missing in the Card List. we'll have to wait for 2011 for the new expansion guys??? It's always been hard to get details from them about releases and they tend to take quite a while. Just be patient and don't think about it too much. It was the same with the last expansion. I personally found it inappropriate, how early the new Expansion was introduced as "coming soon". Not meant as personal Offense, but i really wish, that the next "coming soon" will mean, that the Expansion is ready to launch and will come within the next Weeks. Otherwise, "coming soon" will get the Meaning: "There is an Expansion coming somewhere in the Future", and thats pretty unprofessional, and, like i personally find, unfair for the Players, who dont know how to interpret the Meaning of the Devs "coming soon". Still better than Blizzard release dates. It's not 50-50 between the remaining two, for the second player. I don't understand this. If it isn't 50-50, what is it? And why? It's 60-40 for Flame wave-Inferno, or at least that's what Silbe recorded in an earlier version. My current understanding is that anyone can watch games, and it's up to the players (set on the Options menu) whether or not to show their hand to the observers or not. Sounds pretty useful to me. The new Version will rock!!! Earth: One card 1-4, one Card 4-8, one card 9-12, and one arbitrary. ^ checked in hotseat and get earth 4 9 11 12 once. for eath mb: 1-4; 3-9; 10-12? I once got Earth 1-9-10-12 which just felt ridiculous. I want to say I've had Stone Rain as my high card, but I'm not sure that's ever happened since the expansion. Ok! I think they changed the draw rules. I wonder what the new rules are. So apparently, you can have fire 8 and air 8 in slot 2 now. I don't remember ever seeing that before in either school. And, uh, apparently at the same time, which was frustrating when I realized it. I don't remember how I won that one, but I was pretty surprised. Can anyone confirm that Inferno as your top fire card is possible with the Truth & Beauty expansion? I haven't seen it yet. Plenty of merfolk overlord and lightning cloud, though. What happens if Inferno can no longer be the Fire high card? It means that Fire hands become a lot more balanced, Inferno becomes less of a screw, and the Fire 10/11/12 information game becomes a TON easier to play, because there are at least two Armageddon-banned combos. I definitely think the devs should release the draw info. What's the downside? Also, come to think of it, I'm not sure I've seen lightning cloud high slot, I think that was a draft against the computer actually (woops). I'm still pretty sure I have seen overlord a few times, though, which I've never seen as bad because I've always considered it to be about on par with elementals given the weirdness of water mana. Edit: except in the screen shot I -just posted- there's lightning cloud in slot 4. Dur. But that was a draft game. The screen shot was on the main room in the online league, though. It was my faulty memory that was a draft. I would like this too, but I think they must be aware by now that there have been many requests for this and they still haven't done it... it seems they must have some reason not to want to. I would be interested in hearing what that reason is though. Still haven't seen Fire 9 in the 4 slot.... but here it is in the 2 slot. And I thought having Bargul in the 2 slot was weird. Several dozen games later, I'm convinced that you can NOT get Inferno in the high Fire slot! Yeah, that makes the information game a ton easier. It is certainly a bit jarring when you get a draw like that! I've gotten Stone Rain in the 2-slot a few times! You can play some really nice bluffs against opponents who seem to be playing the information game, if you play your 3rd card (perhaps the Elemental), and then surprise them with an Inferno or Stone Rain later on! -A player's hp can be lowered to below 0 by Sea Sprites, and this player can still survive as long as his health is raised back above 0 by an elven healer, master healer, or insanian peacekeeper before his turn starts. -If you have two Goblin Berserkers sitting next to each other they will both deal damage to the other one, even if this damage causes one or both of them to die. The Berserker on the right can be lowered to 0 hp by the one on the left, but he'll still attack his neighbors before dying. I just tested theseand this is not true in the last version. If a Sea Sprite reduces HP <= 0 this player will be defeated even having a healer right after. Goblin Berserker will not attack another allied creature after being killed by another Berserker. Has someone tested Haste VS Minstealer? Some subtle game mechanics may have changed due to the release of the last expansion. Wiggin it may be prudent to add a note to the third post with those details, saying that the details were collected before the release of the latest expansion, and have not all been re-tested yet? Either that or go and re-test them. I imagine it wouldn't be very hard to do with hotseat games, just a bit time consuming. Lastly, I propose you add E05/E06 to the banned combo list. With E05 in play, you can cast E06 every two turns. I dunno if this is OP or not, so it could be an 'unintentional' ban. Between myself and darkweaver, we've collected over 370k hands. Not a single one has E05/E06 in it. The 1% rule says for adjacent cost cards of the same element, most of them appear together 0.1-0.9% of times. If E05/E06 appeared together even 0.01% of times, we should have expected to see about 35 hands with E05/E06 in it. I guess I could add it, but it doesn't really matter whether you are 99.7% sure or 100% sure imo. Also, it might be an unintentional side effect that they easily change in an update, and then the information would be wrong. Well if you want my opinion, when posting information like this about the game you really should always state what version the information came from. Because next update in the game, any number of that information can change. Mr I already proves my point I think. If you are not re-checking all the information with every update, then you are already unable to guarantee anyone that all the information is up to date. Even if something is a 0.1% combination, I do play like my opponent might have it if their strategy and tactics clearly support the notion. It's interesting that Earth 5 + Earth 6 is literally zero chance, and something I feel would be a good addition to the banned combos unless someone ever sees the two appear together. -Phoenix doesn't die from a damage spell, that also reduced fire power below 10. I just noticed this. This was posted two updates ago? Interesting because that pattern is actually true again now. I think the way described in post 2 is more accurate. The "arbitrary" can't be 1 or 12, so it's not really arbitrary. The way described in post 2 doesn't include the very rare appearances, like F11 in slot 3. So it's more useful. I just find it interesting when I read your old post. Also I think that is a lot closer to how they are 'dealt' in game (i.e. 1-4 Fire cards are dealt, then 5-9 Fire cards, then 10-12 cards are dealt out. Then from the remaining 6 cards, one arbitrary is dealt out), but that is just my guess/hunch. i suggest bees do 4-5 damage to opponent after death. Armageddon is strong but less strong than Dragon, for exemple, and probably doesn't need a nerf. I actually agree that the card is underwhelming, but the numbers prove us wrong. And recently I've learned to play it better. For now, I would recommend you play the game as it is and try to understand it better before trying to change it. That idea doesn't really make sense. Armageddon is strong, but quite balanced at is it. If you change it so that it hits both players, that's a huge nerf, and it would be by far the weakest card in the game. Unless you increase the damage it deals by a lot, it would be almost unplayable. At the lower levels, everyone thinks Armageddon is overpowered. I was certainly no exception at the time. It's one of the first things you grow out of, though. Armageddon is good as it is now. I think that if I were to make a change, it would be to increase creature damage (maybe X + 12) and decrease direct damage (maybe X + 1), basically making it Stone Rain's big brother in the same way that Chain Lightning relates to Flame Wave. It would force you to play a more tactical game as the Forest class. But again, it's fine as it is now. I don't know, I would still rate arma as very nearly the best card in the game if not the best. not that I'm saying I support the notion that it should hit both players, that'd be absurd. Besides I like really strong cards. Also maxstyle: you're proposing a nerf to arma but you want to buff the bees damage which would potentially give the damage back to arma that you nerfed! I think you're really underestimating those bees. In a high-pressure situation they present a really big problem for someone who's trying to stay alive an extra couple turns to reverse your momentum. Such things depend of metagame. Most probably Armageddon had higher winrate when Illusion was default class. Now Dragon have slightly better winrate, even after last nerf. Is there any way we could have these stats for ourselves!? and/or what we're good/bad at using - etc. maybe raw numbers could help us sharpen our play. I think this would be an INCREDIBLY cool feature in the next release, and something that would sell a lot of copies of the next expansion. 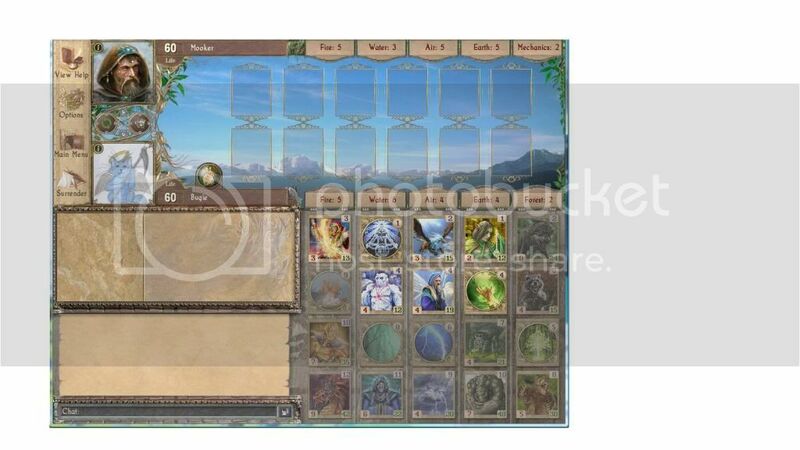 Have a feature either in the client, or online on the website, which tracks your winrate for each card, the number of each creature you have summoned in your lifetime, median life advantage in wins and losses, etc. I know a few things like this are already tracked for Badges purposes. Very interesting to know! Thanks. I just used Armageddon and it killed my phoenixes. Is this is only true if the enemy used the damage spell? I just lost a game that I easily would have won if I didn't nuke my phoenixes to death. Yes, it is only an opponents damage spell. I will adjust the sentence. True, but the question is where does it stop? Isn't there a risk here that all this combo banning actually leads to a less enjoyable, less varied, more restricted gaming experience? Perhaps it even brings unforeseen consequences to the gameplay - like imbalances to the draw that could lead to instrinsic player 1 or player 2 bias? Build up to 7 mana in your Illusion power whilst also allowing your Earth to grow. Then simply double play two Walls followed by the Stone Rain. Whammo. Like I say, where does it stop? I'll bet there will be a critical point where the banning starts to supersede (if it hasn't already!) the wonderful variety of the gameplay - something which is one of the game's major appeals. Forest spite costs 3 and orc costs 5 mana, the attack would be 3 to all creatures and opponent, (Hydra effect for just 8 cost) So just make two forest spites on 1st and 3rd slot and then put orc on 2nd slot, and attack is 6 to all creatures and to opponent (Double Hydra) Just for 5 + 3 + 3 = 11 cost. So why anybody want hydra?!! Forest spite has too much life and only vulnerable to F11 and E9, No other spell can kill it in one turn. So if we just make combo with orc and two spites they'll do average of 18 damage, and two hard to kill creatures, even Ice Golem and Mech 5 cant survive. Its way too overpowered, it makes easy to win dual. Yeah E9 and Wall is good combo too. But we can survive it with E4 and W6 or Master Healer or anything else, But forest spite is undead like hydra. And see it makes ur 8 Illusion mana and 9 earth mana, so it worth the damage done by it. It costs 8 special + Earth 9 = 17 mana. So it worths it, but 11 mana and 18 damage don't worth. Got the point? And yeah F11 and Wall banned already, cos they are overpowered, Board clear + F11 damage to opponent + 20 damage (or 40 if there are two walls) so just one turn kill no matter how much life opponent have. I just don't really see why Stone Rain + Wall isn't one of the 'banned' when the Armageddon + Wall is and the Stone Rain + Meditation is... If you're proposing the E4 or W6 are to the two saviours, then it doesn't bode well most of the time. It's not even hard to do - place blockers, A1 being a good candidate, while you grow Earth and Illusion, then it's 3 turns. It's also not just a straight 17 mana deficit, there's also the mana value of what you take out of your opponent's side with the Stone Rain to consider. Now it depends on ur opponent if u play low level creatures (like A1 u told) on board to keep growth of earth and special. He can ruin ur stretegy with any sweep and u never get a chance to make ur move which requires three turns. Or he can just wait for his death. Couple points: first off, as far as I am aware, banned combinations haven't changed for years. They are essentially what they were when the game started out (I can't remember if they were all there in the first official version or not, but it was very soon after that). Obviously special house banned combinations are an exception to this, but in the same way, those are determined when new classes are in beta and as far as I'm aware none have ever changed or been added since. In other words, I just want to clarify that there are not ban police going around and finding things to remove as you suggest. I totally understand why that would be a concern since it happens in so many CCGs, and I completely agree with you that banning things is always a worse solution than adjusting them so that the combination works instead. Stone rain vs arma has never been a problem. It's a simple issue of resource value. Even though life is how victory is determined, the most valuable resource for most of the game is board control, and this strategy is both painfully obvious when it's coming in and also surrenders huge amounts of mana for no gain at all in board control. You're taking 3 turns to do 40 damage while allowing them to setup anything they want for after you launch your stone rain. It's very rare that a smart player can't use that to ensure their survival and turn the situation into an overwhelming advantage for themselves. If you've found a hand and situation where they can't, then being able to see ahead 3 turns to know your strategy will be a kill is very smart play and you deserve the win. The reason the ban exists with arma is probably not even because of the possibility of laying 2 walls and exploding (though that would be ridiculous in some situations, for sure) but 1 and then doing it. Having a direct damage spell that you can literally almost double the power of in a single turn would be quite excessive. Playing a merfolk apostate boosts the damage by 2. Playing the wall would boost it by 20. The disparity there is significant enough to, unfortunately, warrant a ban. If I were a game designer who ran into a problem like this, my solution would probably be to redesign one of the cards into something with a similar function that doesn't profit so much from the combo. But as it stands, I don't think the few banned combos we have are significant enough to negatively impact the game because there is still such a huge variety of possible draws. I think that Armageddon + Wall of Reflections should be perfectly obvious and I really don't need to explain why that's banned, but as far as Orc Chieftain + Forest Sprite, it's because there's literally no way for the opponent to come out ahead when you play this combo, and it's a combo that you can play early (so your opponent really has no way to interrupt it). First part: there's no way the opponent can come out ahead. At best, they Stone Rain the place, and break even (they come out two mana ahead but take a little damage in the meantime). Short of Stone Rain, they are taking serious damage with no way to stop it. Armageddon cannot come quick enough, and won't kill the Forest Sprites if used immediately. Sweeps don't even get close. If you manage to kill the Chieftain, there's a good chance another one will be ready. Each Forest Sprite will be acting like a glass Hydra, which is ridiculous. Second part: Yes, some combos like Dragon + Haste or Elementals + Archangels are unstoppable too. But these take a lot longer to get on the board than Forest Sprite + Orc Chieftain, meaning there's no way to pressure your opponent into doing something else. This makes the combo not only entirely broken, but insanely boring. In light of that, the ban (from Day One) was a good move. In Kard Combat they did not have these bans and gameplay was awful. If you played the illusion class and got Catastrophe the Armageddon equivalent and Wilderness of Mirrors the Wall of Reflection alike then it was just game over. And the same for earth 3 + fire 5, it was just so strong game would be over by the time you managed to do anything about it. The phoenix owner has 10 or more fire power. *wrath of god sees the phoenix dying and do not increase holy power by 1 for the phoenix. **this can lead to weird situations with emissary of dorlak (death 4) and goblin looter (goblin 5) or keeper of death (death 6); if you replace the phoenix with the emissary, the looter or the keeper will trigger only if you do not have 10 or more fire power. Sonic boom do not stun if it kills something. Otherwise the creature is stunned no matter how many time it revives or what kills it. Here we can see that sonic boom knows that the phoenix is killed and do not apply the stun effect, it is similar to wrath of god in that effect. No way! I wonder if this has ever happened in a real game? Talk about a slow death. I'd be very surprised. In my experience one Astral Guard is enough to decide a game. If you can't immediately get rid of it then a resignation usually follows pretty quickly. I'm sure it's happened before, but you will probably never see it at high level play. I actually recall Jeronimo mentioned that he once had 2 Astral Guards out in an actual duel, at which point his opponent ragequit. Yes. It was against Clever, and I was Holy, he was Time. Holy 5 helped me to get 2nd Astral faster of course, and then the survavility with Holy 1 + Holy 3. This case was a peculiar game, I got the cards I needed to have 2 Astrals, and survived his Time Rush (thanks to my Holy 5 and Holy 3 specially). I remember he went for Time 5 + E3 combo... And in some point he casted F9, but Holy 3 defended well my board. When I played 2nd Astral Guard, he surrendered (got his powers -1). I believe I once got two Astral Guards out as well. The writing was on the wall well beforehand, but my opponent was doing just enough to hang in there and I think I was in a bit of a life crunch so I couldn't get aggressive. In another topic, once, we thought of ways that the game could go into complete deadlock. I think one of the solutions was a board full of Astral Guards and (two or more) Demon Apostates, versus a board with Master Healer plus five Insanian Shamans. Yeah, the effects of Mindstealer / Ancient Horror etc only apply to the standard attack of the creature, not to extra attacks due to effects like Hasten. This is hard to reflect in the wording of the cards without causing more confusion than you save! I agree it is worth noting. After reading these threads and a lot of trainings from old Archy, I can win a few more games to come from level 3 to level 5. Thank you guys for writing such detailed strategy guides. I got a draw with Mind Master AND Astral Guard... I thought it wasn't possible. Yeah but I thought 3rd water slot was for cards up to 10 max. I used it as a golden rule and I was wrong. hey you are right! wiggin's original post above is wrong! same goes for all 4 elemental houses: in wiggin's post it says that 3rd slots can go up to 10 only, but in the (improbable) scenario of getting arma + dragon, mind master + astral guard, air elemental + titan, or master healer + hydra, then your 3rd slot costs 11 indeed! wave can you edit it? No, donÂ´t edit it Wave, itÂ´s fine imo! I am in Japan witbout access to my computer for a few weeks and I dont want to risk making mistakes while editing posts, so when I get back to America I will look into the best way to explain the rare distributions. If I (or Wiggin himself) still havent fixed the posts by Oct 15th thwn please feel free to post here again to remind me. Thanks! Wavelenght only edits posts, IN AMERICA! I laughed hard and showed my friend when I read that, Forestry. 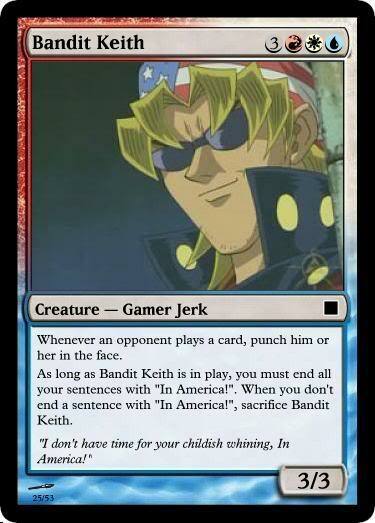 :) Bandit Keith 4evr! Fire: 3rd slot maximum increased to 11. Water: 3rd slot maximum increased to 11. I'm almost sure I have, on at least one occasion, seen Sea Sprite in the 2nd slot and Ice Golem in the 3rd slot. Can anyone confirm this is possible? Air: No changes made. I don't ever remember seeing Air Elemental in the 3rd slot. But I think it may be possible. Can anyone confirm whether this is so? Earth: 2nd slot maximum increased to 9; 3rd slot maximum increased to 11. I'm almost sure I've seen Nature Ritual as a rare 2nd slot draw - can anyone confirm this is possible? What a pity...our prophet has left us! Water: 3rd slot maximum increased to 11. Can anyone confirm this is possible? So, if I get it right...WigginÂ´s slots with 1%-rule now and RobÂ´s without? ThatÂ´s fine Wave! I'm almost sure I've seen Nature Ritual as a rare 2nd slot draw - can anyone confirm this is possible? I've updated the Earth Slot 2 minimum to 2, and will continue to update these as they're proven. Wiggin can correct these back to "no 1% draws" if he wants to, but since this is a very prominent thread and it says "possible slot distributions", I want to make sure all the POSSIBLE distributions are indeed up there. Yes, Air 11 is possible in slot 3. Pretty sure I got E11+E12 once too. Also, completely off topic, but when you move a Wall of Reflection (ill 4) with YOUR Rescue Operation (Gob 0), it doesn't heal the wall. This rule might also apply to Chrono Engine, I didn't experiment it though. Rescue Operation heals only own creatures! Oh yeah, I'm dumb lol ! Rescue operation was overall too weak when it healed opponent creatures. Taking that away gave little much-needed incentive to use it. 1) Rescue Operation was far inferior to its partner card, Goblin Hero (which used to be 3/17). 2) The ability to use Rescue Operation on an opponent creature is one of its most strategically interesting uses. You can guarantee, for example, a void slot for whatever creature you have in the slot that had been opposing it. However, too often healing that enemy creature is too much of a drawback to justify the use of a turn to move it. Therefore, ignoring the heal when used on an enemy creature makes the choice between "use it on your own creature" versus "use it on the creature that's opposing it" into a much more interesting decision.